I found some shorts that were size 12-18 months, which is what I was wanting the skirt to be, then I measured 3 inches above the waist and cut it off. I ironed down the fold and then sewed around the edge, but left a 1 1/2 inch opening to get my elastic in. I used a safety pin to guide my elastic through the waist. After the elastic was through, I sewed it together. I sewed an “N” on the elastic to make sure that it would stay in place (I’ve heard that’s a good way to do it?!). Sewed up the opening once the elastic was all inside! Now the skirt part was done! Just needed to add a little flair! I cut a 1″x 24″ strip of fabric. Folded one end to a point and placed it where I wanted the center of the flower to go. I ran a few stitches over it to hold it in place. After the tip is sewed down, I fold and wrap the strip of fabric around and sew it down! It doesn’t need to be perfect, and actually looks cute if it is a little messy. I added a few more flowers! I made them different sizes by adjusting the length of the strip of fabric! All done! And so easy! GORGEOUS! I love the way you did the flowers! I would love if you came and linked this project to my clothes upcycling page. It has a long term linky, so your project would stay there for more than just the week of a usual linky. We have over 80 projects linked up now ? some fantastic ideas ? Do come and take a look! 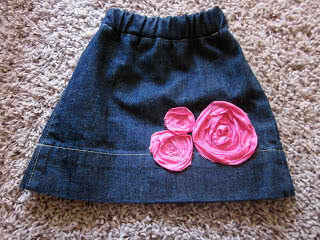 This is the most gorgeous little denim skirt I've ever seen. Genius that this comes from a pant leg, and the pink roses add to their adorableness. Dropping in from Jill's Creating My Way to Success to say hello. Mila from http://hereundertherainbow.blogspot.com. Why doesn't anyone ever sew a piece of yarn or string through the waist to help pull the elastic through, it seems so much easier than the safety pin method.